Electronic Manufacturing Services Market « Global Market Insights, Inc.
With increasing need for cost-effective production of automobiles and consumer electronics, the electronic manufacturing services (EMS) market has gained enormous momentum over the last twenty years. Consistent rise in the consumption of mobile phones, portable electronics and connected devices overall has helped the growth of several small EMS players to meet the global demand. Vast opportunities in the aerospace, industrial and medical devices segment have also boosted the electronic manufacturing services industry. More recently, the communication and consumer electronics segment have driven EMS providers to pursue key expansion strategies and technological developments. Boasting revenues of more than USD 450 billion in 2017, the global electronic manufacturing services market will eventually witness increased returns from the aforementioned sectors. EMS providers have enhanced manufacturing facilities and expertise, also offering additional services like testing and logistics to help OEMs and major consumer brands achieve better profit margins, lesser time-to-market and flexibility. Labor costs in developing economies, especially in the Asia-Pacific (APAC) region are considerably low, reinforcing the electronic manufacturing services industry expansion in countries like China, India and most South East Asian nations. With EMS companies taking care of the frugalities involved in product manufacturing, OEMs like Apple, Intel, Dell and Sony are able to concentrate their resources more towards research and development, as well as marketing campaigns. Consequently, the APAC electronic manufacturing services market has grown tremendously owing to continuous introduction of new products by OEMs, particularly smartphones. As mobile technologies are evolving at a rapid pace and becoming cheaper, smartphones are expected to constitute almost 48% of the global consumer electronics segment by the end of 2018, and it is a well established fact that most of these devices are manufactured by EMS providers in Asia. Elaborating further, Taiwanese company Foxconn, which is the world’s largest EMS provider, manufactures smartphones for Apple, computer equipment for Dell, Intel, HP and Microsoft, along with electronic devices for Sony, Google and Amazon. The company has set an example in the electronic manufacturing services industry for adopting innovative business models and creating a global presence. It had recorded a 50% growth in earnings during December 2017, mainly driven by the shipment of Apple’s flagship smartphone model, iPhone X. Simultaneously the APAC electronic manufacturing services market experienced accelerated growth due to increased production of smartphones launched by Chinese OEMs, such as Xiaomi. The massive growth potential for consumer electronics in APAC can be surmised from Foxconn’s recent announcement according to which it is planning to expand its semi-conductor production operations in China. Demand for these small equipment is rising exponentially and an expansion effort by a major EMS provider indicates the same, signaling growth prospects for upcoming EMS firms who wish to penetrate the segment. Foxconn is also demonstrating the trend among companies in the electronic manufacturing services industry shifting from a single key income source to producing more diverse consumer electronic products. Almost 50% of Foxconn’s revenue comes from Apple, which is a huge dependency on a single entity for a manufacturer of this magnitude. Keeping this in mind, the company earlier this year decided to join forces with camera maker RED Digital Cinema to produce affordable and professional quality film cameras with 8K resolution. It is also in the process of building manufacturing facilities in China and U.S. to make large-screen display panels. It is predicted that globally, nearly 2 million televisions with 8K display would be shipped by 2020 itself, and with a number of EMS players located in the region, the segment will generate additional remunerations for the APAC electronic manufacturing services market. All in all, with unprecedented growth in the demand for consumer electronics over the next few years, the electronic manufacturing services market will witness tremendous inflow of capital for expanding production capacities. Constant innovations, for instance EMS company New Kinpo Group’s AI-powered manufacturing robots and autonomous manufacturing capabilities, will further attract OEMs towards Asian companies. 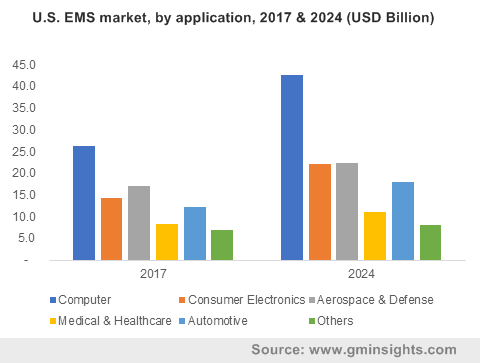 Key players dominating the global EMS market share include Foxconn, Integrated Microelectronics, Inc., Benchmark Electronics, API Technologies Corp., Celestica, Inc., New Kinpo Group, Venture Corporation and Sanmina Corporation. This entry was posted in Electronics and Media and tagged Aerospace & Defense, Automotive, Computer, Consumer Electronics, Electronic Manufacturing, Electronic Manufacturing Services Market, Electronic Manufacturing Services Market Overview, Electronic Manufacturing Services Market Report, Electronic Manufacturing Services Market Share, Electronic Manufacturing Services Market Size, Electronic Manufacturing Services Market Trends, Electronics Manufacturing Services Industry, EMS market, Engineering Services, Global Electronic Manufacturing Services Market, Logistics Services, Medical & Healthcare, Test & Development Implementation, Worldwide Electronic Manufacturing Services Market.